Today, the name Tiffany is synonymous with products featuring stained and art glass pieces, copper foiled together, and particularly light fittings that benefit the beauty that the electric light bulb does to these when lit. Quoizel provides a range of looks that capture the Tiffany spirit; from highly traditional and transitional styles to more contemporary interpretations sure to suit any modern-day décor. 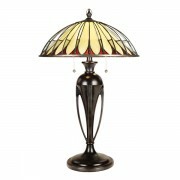 Whether you are looking for deep jewel tones and intricate patterns to serve as a statement piece in your home or whether you seek a light, neutral palette that offers the beauty of stained glass as a subtle complement to your room décor, Quoizel has many Tiffany style art glass lamps and lighting fittings that will suit your needs perfectly.